Many everyday products can be used in ways they were never intended. One item that can be used as a part of many DIY projects and craft projects is a simple mason jar. This is a type of jar that is generally used for canning, but can also be used in other ways. If you want to add a touch of style to any room in your home, then making a mason jar chandelier is a great idea. 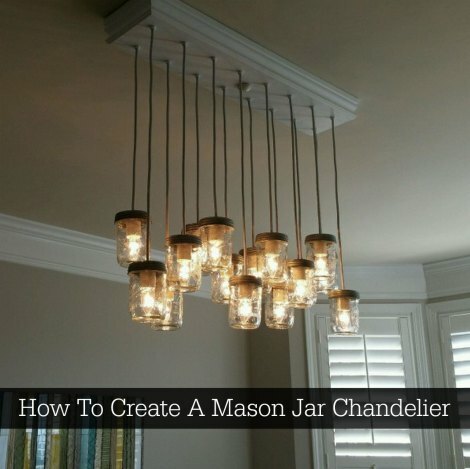 A few basic supplies and some specialty items are needed to make a mason jar chandelier. You will use wood to make the base for the chandelier and means a few tools are required. The wood you can use to make a mason jar chandelier might include scrap pieces or newly purchased pieces. You can find various types of wood and the tools for this project at any home improvement store. This is also where you will find the specialty items that are necessary to make a mason jar chandelier to use in your home. The specialty items you need will include electrical wire, sockets, a junction box, and all the connectors that are required. The design of your mason jar chandelier will depend on the size you prefer and the area it will be used in your home. One important thing to keep in mind is the wiring that is required is not a task to do if you do not have any electrical wiring experience.